Today I was treated to the hospitality of the Awarua Runanga at their wonderful Cliff Whiting decorated Te Rua Aroha Marae and wharenui. 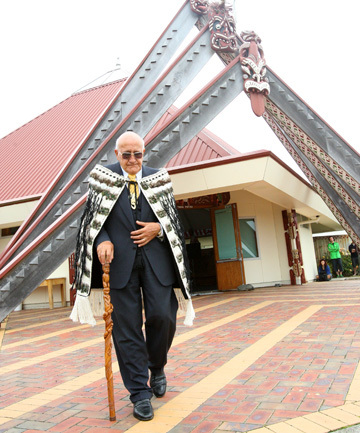 The Powhiri included an acknowledgement of the Green Party by Sir Tipene O'Regan and some "foot in mouth" moments from the Deputy Prime Minister, Bill English, when he put down northern iwi in an attempt to curry favor with Ngai Tahu. Sir Tipene explained the background of the constitutional review that he and Professor John Burrows are chairing. He described a constitution as being the overarching rules that dictate how we manage ourselves through legislation and law. Rather than just letting ivory towered academics dictate the form it may take he would like the people of New Zealand to have an input on how they want New Zealand to be. Bill English and Pita Sharples are the parliamentary representatives who will present the final report to Cabinet. Bill explained that the review will be carried out independently of politicians but expressed his own view that we don't have a constitution presently and that we do very well solving problems without one. He cited Zimbawe's constitution as the best he had seen, but that it didn't seem to influence the current regime. Bill was mistaken in his view that we have no constitution because although not formally recorded as such, we do have a collection of statutes, treaties and constitutional conventions (similar to UK) that serve the same purpose. It does make sense that we should formalize a constitution to make sure the Treaty of Waitangi is properly recognized and to pave the way for inevitably becoming a republic. The Treaty currently only exists in law where there is specific mention of it in legislation and as it was originally an agreement between Maori and the crown, a shift to republicanism will make it redundant. My personal view is that a formal constitution could recognize the Treaty of Waitangi in law, would properly recognize basic human rights (often ignored in current legislation) and also include environmental guidelines. Parliament currently operates with few checks and balances and without an upper house or formal constitution, has full legislative sovereignty. It is true that Zimbabwe's constitution has not limited the excesses under Mugabe but any document is only a collection of words that only has value or power if there is the will to recognize it. New Zealanders are generally fair minded and law abiding so that a formalized constitution would probably have the status it deserves, especially when you consider how the Treat of Waitangi has been recognized. The longest session of the day was devoted to the Waituna Lagoon and we had presentations from iwi, scientists, Environment Southland and Fonterra. I have already covered similar ground in other posts to what was covered during this hui but I was impressed by the PR from Fonterra. The Fonterra representative (whose name I don't recall) did his job well with a polished mihi and a convincing presentation that explained how effective partnerships with voluntary groups had seen wonderful riparian planting and how their leadership was also driving higher environmental standards from their farmers. The reality of course is that they are spending more on PR like family fun days then on environmental initiatives and their record for influencing farmer practice is abysmal.